Today in Masonic History Miguel Alemán Valdés passes away in 1983. Miguel Alemán Valdés was a Mexican politician. Alemán was born in Sayula, Veracruz, Mexico on September 29th, 1900. His father, a revolutionary general, was opposed to public education so Alemán was not permitted to attend local schools. In 1920 he attended the National Preparatory School in Mexico City. He would go on to the National School of Law graduating in 1928. As an attorney, Alemán represented workers who suffered from occupational diseases and accidents among workers. He would win two major victories against corporations which would gain him the support of the labor unions. Representing the Party of the Mexican Revolution, Alemán served as the Senator from Veracruz from 1934 to 1936. In 1936, the governor of Veracruz was assassinated and Alemán was tapped to replace him, serving until 1939. 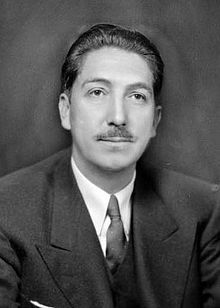 From 1940 to 1945, Alemán served as the Secretary of the Interior. As secretary during World War II, Alemán had to deal with Axis espionage and the Sinarquistas. The Sinarquistas were a fascist group in Mexico made up mostly of Roman Catholic extreme right. They were violently opposed to the revolutionary parties policies and agenda. In 1945, Alemán was chosen as the presidential candidate for the revolutionary party. He would win election in July of 1946. He would be the first non-military president in Mexico. As President, Alemán would pursue and industrial economy and would highly favor business. His administration would expand education. He would oversee the diversion of the Lerma River which brought an end to the water problems of Mexico City. He played a major role in development and support of Acapulco as an international tourist destination. Also as President Alemán would continue the strong ties to the United States that were established during World War II. Although he would refuse to send troops to Korea. Alemán's presidency is considered by some to be part of the Mexican miracle, others feel his presidency is tainted by political corruption and crony capitalism. Alemán passes away on May 14th, 1983. Alemán was a member of Antiquities Lodge No. 9 of the Grand Lodge Valle de Mexico.